With the demise of the Ksyriums for the time being, and the Fuji taken apart (and sold), my need to tinker turned to the Colnago. The Fuji was my race bike, so I've decided to race the Colnago in the DC area crits next year instead. This meant shedding some grams, sharpening steering, improving the aerodynamics and most importantly, looking fantastic. 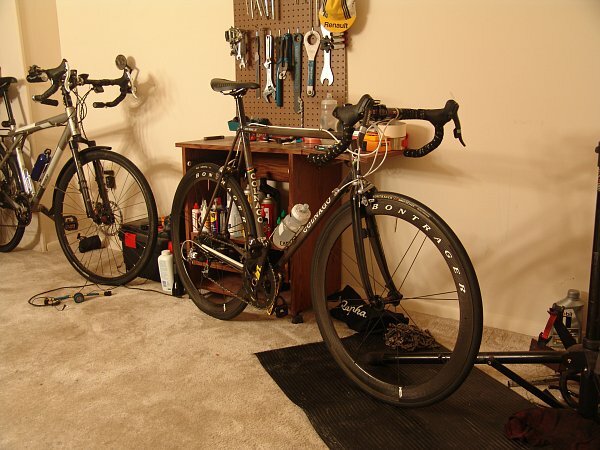 All these goals were accomplished by swapping to a threadless carbon fork and some full carbon deep aero wheels. 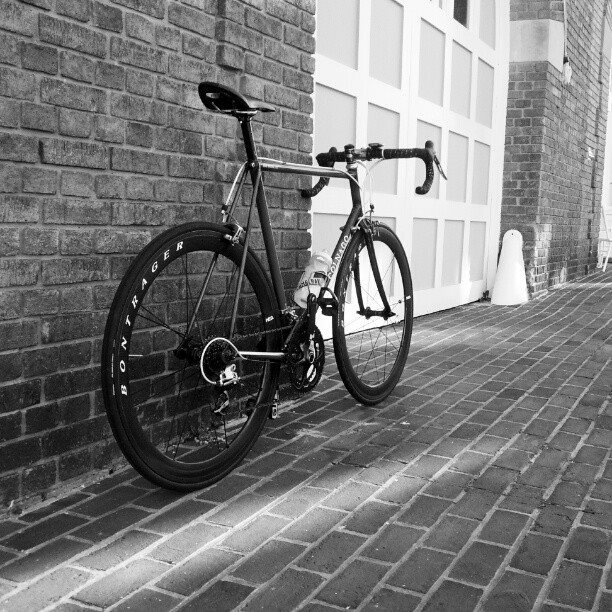 "Deep aero wheels and carbon fork on a vintage Colnago is crazy!" you might exclaim and you'd be right. But as my girlfriend will tell you, I've never let something like that stop me. The new wheels and fork have changed the demeanor of the bike in some very noticeable ways. It's not a night and day difference, the essence of the bike-the long haul grand tourer-is stil there, it doesn't constantly chomp at the bit to go to threshold the way the Fuji did. But just beneath the surface there is a darker, more sinister undercurrent to the ride that wasn't there before. I find myself jumping out of the saddle to shoot for the top of climbs that I would normally spin up. Maybe it's the wooshing of the carbon wheels, maybe it's the slightly muted stiffness of the carbon fork, or maybe it's the slightly more aggressive saddle/bar position. Who knows. If the old version was an Aston Martin DB9, the Colnago 2.0 is a DBS. I'm also not going to pretend that I'm not a vain roadie (because I am). Looks are important, especially when the frame is vintage. I know that this bike isn't everyone's cup of tea but to my eye, the mix of old and new, steel and carbon, the naked frame with visible brazing and modern drivetrain is just sublime. It looks as at home whether I'm wearing Rapha and out for 200km of discovering new roads or in full team kit chasing prems at a local crit. Not too shabby for a frame that's older than me and was destined for the scrap heap.